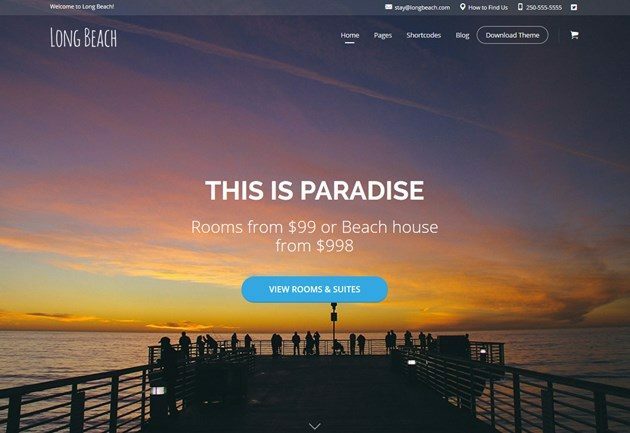 Looking for the best WordPress hotel booking themes with a reservation system? I found out that lots of the themes advertised as “hotel booking” ones, actually come with a simple booking form by email, when each reservation request should be processed manually. No good for hotel managers, all the more so for guests! To create more demand for direct website reservations, your hotel website should be competitive with OTAs in terms of navigation, ease of use and security. That’s why a theme with the automatic room booking submissions (with a payment or without) is a smart investment in your business. In this collection you’ll find WordPress themes with a room booking plugin built in. The chosen themes have a special emphasis on elegance in design and are powered by different third-party property booking plugins. Don’t focus on design toys too much – though your hotel website should look really polished and professional to build credibility with your audience, its main function is to serve the needs of travelers. And they want to book the property safely and easily, resting assured that no more actions are required. 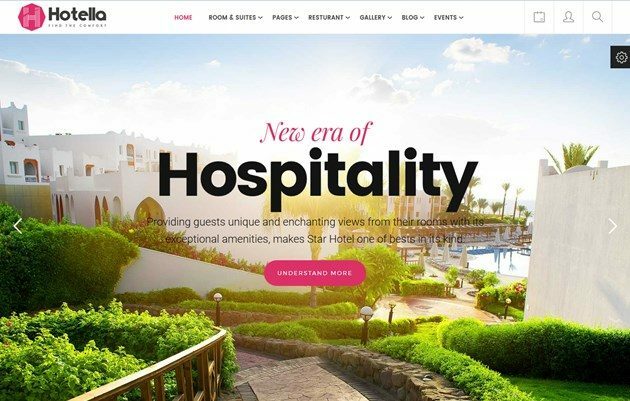 The WordPress hotel themes in this collection can suite all types of hotel establishments: hotels, hostels, apartments, luxury resorts, inns, vacation rentals, etc. The description of each theme is supplied with a detailed overview of the theme and its property reservation system, so it’s easier for your to pick up the benefits. Hopefully, you’ll find your lucky starting point! Overview: The Sailing theme is bunched with a good dose of animation and trendy content modules like video and slider, so if you are looking for a pretty dynamic theme, take a look at this one. Despite quite a heavy “luxury” look, its designers were creative enough to keep it elegant and balanced, partly thanks to a white background and eye-catching Parallax effects. Each of 5 available demos are pretty rich visually: you can choose from ready-made layouts for BnB, hotels, etc. The search availability form, icons and some other parts are styled differently in different demos, so you can choose any to your liking. There are lots of tools the theme is supplied with to enrich your customization work: a Revolutions slider (a premium tool included for free), a user-friendly drag-and-drop Page Builder, editable colors and fonts, etc. The Sailing also allows you to go with a one-page design option: if you prefer such a simple and user-friendly solution, it won’t be a problem to set it up with this theme. To start the editing process easier, you can use a demo content importer that comes with the theme. You may also tweak colors and fonts. Testimonials are powered by a custom plugin by ThimPress (Sailing creators) and look really stylish. The Sailing is compatible with WooCommerce, WPML, RTL and some other popular plugins. WordPress property reservation system: the theme is powered by WP Hotel Booking plugin – an advanced version of their custom free plugin. This is a smart way to go with a one-stop hospitality theme like this, where design and a booking system are created by one team. The booking system will let you regulate the presentation of rooms, set their capacity, amenities, add photo galleries, extras, add different prices for different days, etc. You may also set different currency for your properties or block specific dates. The plugin supports coupons to provide your guests with discounts. However, the reservation payments should be handled via WooCommerce plugin (I’d rather see a shorter chain of supportive products), so you’ll sell reservations as WooCommerce products. 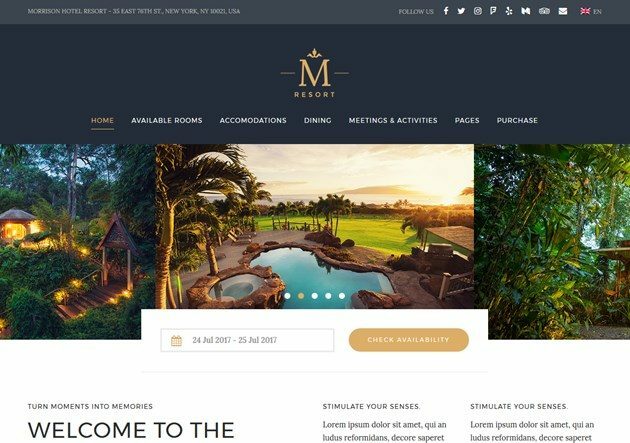 Overview: Villa Rental is an elegant WordPress theme for any type of hospitality business (not only villas). It features a pretty intuitive design with a lot of white space to increase the overall usability. You can customize a theme background, texts, colors, add and remove widgets for extra content modules. The properties listing also looks quite simple and stylish – you may display them in a grid or list view mode. Villa Rental features a full-width slider with titles and descriptions that you can customize to your needs and feature all hot accommodations right on the front page. It’s compatible with top popular WordPress plugins and can be translated. If you plan to sell something additionally, Villa Rental is shop ready. WordPress property reservation system: The reservation plugin behind the theme is a Booking extension for Templatic’s Tevolution plugin (it enables advanced functionality in their custom themes). Hotel staff can handle the bookings without efforts or tech skills. All standard functionality is included into the booking system: search availability calendar, details of accommodations with the photo gallery, minimum days stay option, tax payments, seasonal rates (prices) for properties, online payments, etc. A great news is that a property booking form is also customizable, so you may modify fields to match your hotel establishment. The system allows to add extra hotel/villa/apartment services you can charge additional price for. One more great thing, the admin dashboard lets you generate discount coupons for your loyal guests (they can use them on the checkout page). Guests can pay online for their reservations via PayPal or submit a pre-bank transfer. However, if you need more payment gateways like Skrill or Stripe, they are available as premium extensions (you’ll need to pay for each or may buy all in a bundle). 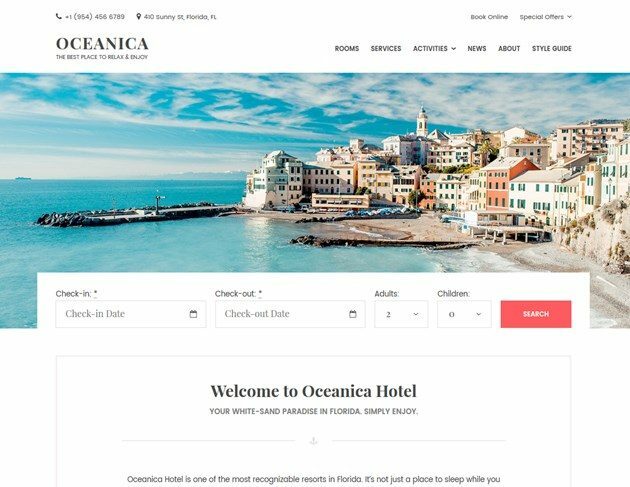 Overview: Oceanica is a very clean-looking WordPress hotel booking theme with a booking engine. It impresses with a perfect color scheme, elegant readable fonts and neat content blocks (those semi-transparent icons and frames look really cute). The good news is that it is also very lightweight in terms in functionality: it’s not overloaded with redundant plugins and widgets. The front page is fully customizable visually with a WordPress Customizer: you can add/delete widgets like Search Availability form for online bookings, featured posts, Testimonials, site title and logo, galleries and other content modules. The theme features 4 menus (3 in the header and 1 in the footer), which is great for the website intuitiveness: website visitors always navigate to the header of footer to find the needed info quickly. You can put all important info like contact details or Reservation button into these perfectly visible website areas. Grid and full-width layouts are available. Colors for customization are unlimited. Oceanica is maximum WordPress native: it means you don’t need any extra engine to create beautiful galleries, they can be done with native WordPress parent and child page templates. This is a good way to save your content even if you uninstall the theme. Moreover, this is a sign of a far-sighted and responsible WordPress theme development approach. WordPress property reservation system: A full-blown WordPress rental system, which is not a third-party one, but a custom plugin by MotoPress – Oceanica developers. So, you get a custom design and software seamlessly integrated by one team. This is, by the way, a money saving: extending your yearly license you’ll be paying for updates and support for 1 product only (the theme), and not for 2 ones as with the majority of themes (the theme + a third-party reservation plugin). As for the tools, this WordPress booking plugin allows to feature different types of rooms with all details and photos, create different pricing for different dates, set rates, etc. You may allow guests pay online (PayPal, 2Checkout, Stripe, Braintree, Beanstream/Bambora methods are included for free; WooCommerce Payments is a premium addon) and after arrival, block specific dates, create discount coupons, let guests book multiple accommodations during one reservation, and have even more control over the plugin. The plugin also supports complete taxes and fees info, auto sync with OTAs like Booking, and more. All the submitted bookings are automatically stored at the backend and can be previewed either in a list or in a handy calendar, so everything can be managed by hotel staff even without any technical expertise. Admin and customer notifications can be sent automatically. The plugin is available in 14 languages. 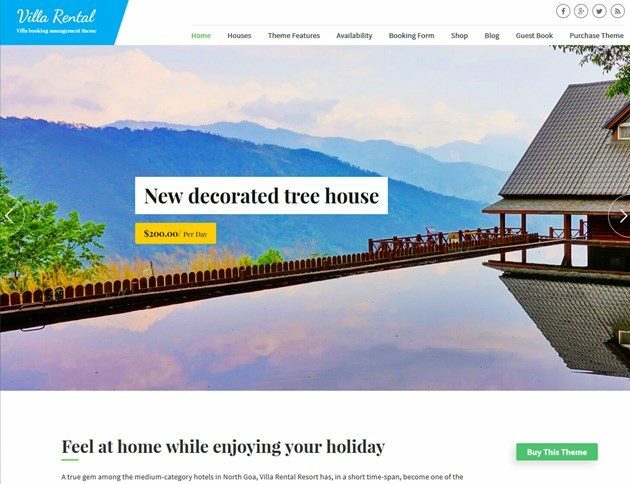 If you need to rent out multiple accommodations in different locations (but not hotel chains), these guys also offer Villagio Property Rental WordPress theme (with the same hotel reservation system), Ciestra Spa Hotel WordPress theme and lots of other rental property WP themes. Overview: Morrison Hotel WordPress theme comes with a great bold design, elegant rooms listing and stylish color scheme. The theme offers you 3 professional demos to build your unique website much faster (hotel, B&B and resort templates are currently available). The rooms listing in each demo deserves a special compliment – the content blocks with room details come with perfect hierarchy, user-friendly interface of a property booking page and overall readability. In terms of functionality, Morrison Hotel is pretty rich and flexible: you may use a drag-and-drop page builder to create website pages yourself, different header alternatives, boxed and wide layouts, sidebars, etc. 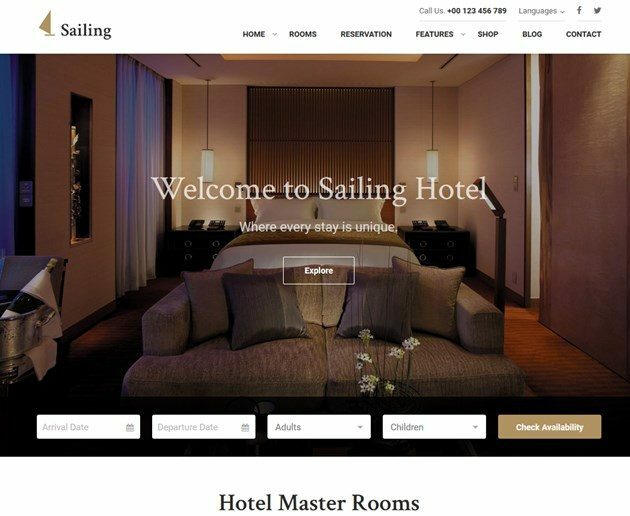 With a help of WordPress Customizer, you can create a perfect home page for your hotel, even without knowing a lot about WordPress. The theme offers 3 ready-made color skins with complementary colors – dark, blue and purple. Morrison Hotel also comes with a child theme built in, so it can help you modify your website content faster and safer. WordPress property reservation system: Morrison Hotel is powered by the Easy WP Hotelier plugin, which lets you create a properly categorized properties listing with the online booking option. Setting up the booking system you can include room rates and set seasonal pricing. Overall, the pricing system is pretty flexible. There are 2 bookings modes you can work with: instant booking and manual booking (required manual approval by the admin). You may also turn off the booking option and simply list your rooms with details. Users can pay for the bookings via PayPal a full or deposit price. However, if you need more payment gateway options, you’ll need to buy extra extensions. You may also disable the chosen dates and block online bookings. The booking plugin is powerful enough to accept multiple bookings in a single reservation. All email notifications for guests and admins are ready to be customized. 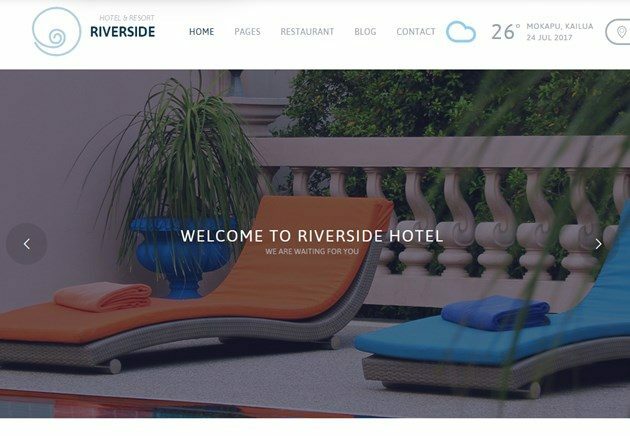 Overview: Riverside Resort by TeslaThemes is a beautiful elegant theme for your rentals. Colors and fonts are extremely attractive and compatible. The theme comes packaged with stunning galleries, properties listing, pricing tables, call-to-action blocks and is fully customizable. All the important pages that may come in handy for hospitality business are also included (Spa, Events, Meetings, etc.). One-click demo content import is available. Riverside Resort WordPress theme features a couple of useful extra content modules like weather and map widgets. If you want to feature your hotel restaurant, the theme comes with a pre-made stylish restaurant page. A Pinterest blog style will also be a great visual promotion for your site. WordPress property booking system: the theme is powered by WP Hotel booking plugin – it doesn’t offer any super advanced list of options, but the essential basics are provided. For example, the booking system in this theme allows you to display a reservation calendar, add rooms with all details (capacity, description, photos), enable online (via PayPal) and offline (after arrival) payments. You may also add and sell extra room packages with different services. As the website admin, you can edit submitted bookings or add new ones. You may send automatic emails to guests and website administrators and edit them via the admin dashboard. 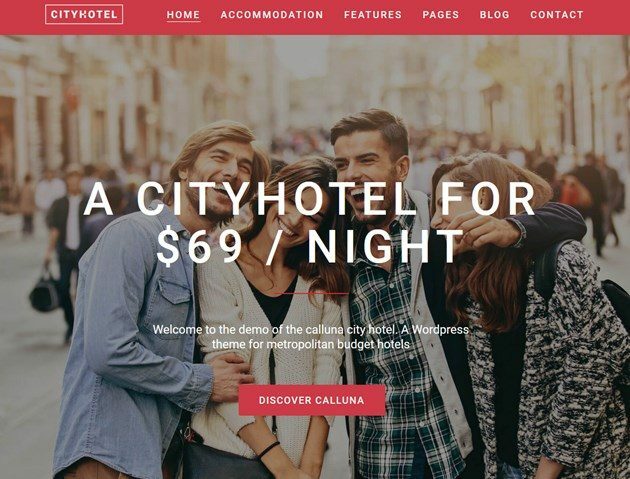 Overview: Hotel Calluna is a an attractive hotel and resort WordPress theme with the property reservation system. It currently comes with 3 demos allowing you to choose the one that suits your needs best: a luxury hotel, an urban hotel and a resort. The home page of the main “luxury” hotel features full-screen content modules with huge bold fonts and a full-screen slider. I believe this demo is one of the most winning designs and can be actually customized to suit any hospitality business niche. The search availability calendar is also quite big, so the visitors should not have problems booking a room. The front page can be customized with WordPress Customizer allowing you to update colors and styles of the theme. You may also choose a header style and set it to transparent, full-width or boxed one. Hotel Calluna is also bunched with a couple of useful custom shortcodes to help you create more unique pages. With the built-in MegaMenu plugin you’ll organize your navigation menus easier. Moreover, the theme is packaged with a couple of premium plugins that are included for free: a Visual Composer plugin to help you build pages with any type of content visually, MasterSlider plugin and Easy WP Hotelier for online reservations. A smart saving of your budget! WordPress property booking system: the theme is powered by a fully functional Easy WP Hotelier booking system, which comes with lots of needed options to make your reservation system work properly. This system will let you create rooms, add their details and photo galleries, set different room prices based on dates and seasons (or just a global price). You may also set a special period sales and regulate prices for different rooms. Supported payment gateways: PayPal and Stripe, or the ability to use Contact Form 7. 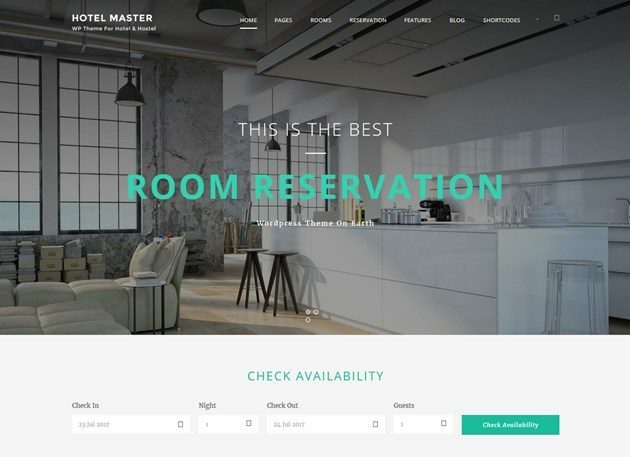 Overview: Hotel Master is one of the most popular WordPress hotel themes with a reservation engine. It’s suitable for any type of hospitality business such as hotels, guest houses, hostels, B&B, apartments, etc. It comes with several cool demos that will help you choose the preferable business niche and color scheme – each one is an exclusive design solution. A one-click demo content importer should also speed up your work. A custom admin panel of the theme will provide you with multiple settings and customization options. The theme is powered by GoodLayers’ custom page builder, which can help you build pages and posts visually with drag and drop. You can use the Master Slider to make your front page more attractive and dynamic. This theme allows you to feature the rooms in 3 room layouts. WordPress property booking system: the theme is supplied with a fully functional property reservation system. With its help you are free to create a full list of properties, feature their amenities and add a photo gallery. You may also sell additional hotel services allowing guests to reserve them in advance. Thanks to a flexible pricing system, you can set different prices for the same room types depending on dates/days. Additionally, it allows to block rooms at particular dates and set automatic consecutive night discounts. The booking system supports iCal synchronization – an ability to connect your hotel to OTAs like Air BnB, however it’s limited to just one room of the the same room type. Guests can pay a full or deposit price via PayPal, Stripe, Paymill and Authorize.net. The life of the website admins is also simplified: the theme allows to generate summary reports to check rooms occupancy by dates. Overview: Bellevue Hotel WordPress theme comes with lots of different demos, so you may pick your favorite one: a hotel, urban countryside, a beach house, etc. So, you are not limited to one design only. All demos come with stunning Parallax effects and are visually perfect. The customization options of this theme are pretty impressive: you may change fonts, colors, use dark or light header styles, sidebars, add different widgets, etc. You are also free to edit the pages with a user-friendly editor. The custom admin panel of the theme is quite handy and gives you access to almost all parts of your site. Bellevue Hotel supports wide and boxed layouts. An included premium Master Slider will help you build great slides and create more visual promotion for your hotel. With the theme you also get a fantastic icons pack (more than 1000 icons included). WordPress property booking system: the booking system in this WordPress theme is pretty straightforward: the guests can use the search availability form, provide personal details, choose extra services and add them to the reservation. WP Booking System Pro plugin drives the listing of accommodations and the reservation payments are made via WooCommerce plugin. It means your guests should add a needed accommodation to cart, then go to checkout page to complete the booking, pay and confirm reservation. iCal for managing your bookings via different channel managers is also supported. The properties can be displayed in a grid or via custom post types. The guests can pay with PayPal or use check payments. For some important features like deposit payments, you’ll need to get extra addons and figure out how to work with them. If you like the theme (which is obviously cool), it would be probably easier to go with another property reservation plugin for WordPress. 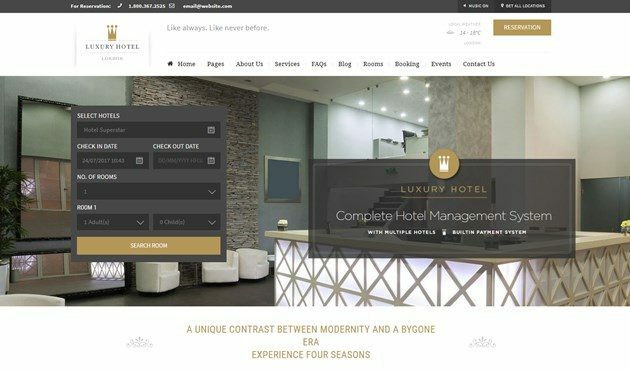 Overview: Luxury is a great WordPress themes for different hospitality business fields: hotels, resorts, apartments, hotels+restaurants, and even hotel branches, making this theme stand out. You may import dummy content with a one-click importer and start customizing the theme really faster. Overall design comes with a great hierarchy of content blocks, awesome custom icons, and great readable fonts. Luxury WordPress theme supports Google fonts and unlimited colors to help you give a brand look to your website. You may also add sidebars to different pages. A drag-and-drop editor to construct beautiful pages without any HTML and CSS is at your disposal. With a built-in Revolution Slider you can feature beautiful slides of your hotel establishment. The theme is also translation ready. WordPress property booking system: a room reservation engine allows to add unlimited room types, supply them with the needed parameters, add special offers by dates, etc. You may also regulate your prices setting up the seasonal pricing. The frontend search availability form allows guests choose any needed number of rooms and set how many guests should be located in those rooms. So, multiple bookings is pretty straightforward with this reservation system. Guests can pay with a CC, via PayPal, Skrill, and Authorize.net. The reservation engine allows to block rooms when needed, so the opportunities of the hotel staff are really wide. Overview: this theme is a perfect combo of attractive design and a handy room reservation engine. It comes packaged with 4 stylish demo templates for hospitality business that differ in color scheme and overall design. The front page of the Hotella can be edited with the live WordPress Customizer, which is really a breeze for newbies. The header of theme is very flexible: you may add a small search availability calendar, tiny useful widgets like weather and Google maps. The menus can be managed with MegaMenu. One more powerhouse of the Hotella is Webnus, which will allow you editing website typography, theme styling, background option, header and footer options, etc. If you need to edit pages visually, the Visual Composer plugin is there too. The accommodations of your hotel establishment may be featured in a grid or list view. Several icon packs are also ready to help you create your unique website. Events Calendar plugin that is built into the theme will let you bring more visual promotion to your hotel events. The theme is fully integrated with WooCommerce and Contact form 7. I have to admit that Hotella is a bit overloaded with different plugins, but if you need that functionality on your site, that’s a good help and money saving. WordPress property booking system: online bookings are driven by the AweBooking plugin, which is currently removed from the CodeCanyon, but the theme still uses it. The old version of the plugin allows to create rooms listing, set guest limits for each room, set adult and child prices, customize the search availability form labels, set seasonal pricing, sell services and packages, etc. Guests can also choose a number of needed rooms working with the search availability form. The booked rooms can be viewed and managed via a handy admin calendar. If you like the theme design, ensure with the theme providers that the booking will work properly as there might be the problems with the AweBooking plugin. You may also choose this theme and integrate it with any other hotel booking system available for WordPress. It’s worth mentioning that there is one more website, Hermes Themes, which is totally dedicated to WordPress hotel themes and hospitality business. So far, the themes are just designs without a room reservation system, but guys give their recommendations of some third-party software you may use to power their themes. So, what is your choice and for what reason? Or, have you probably got a questions? We are eager to know your thoughts!